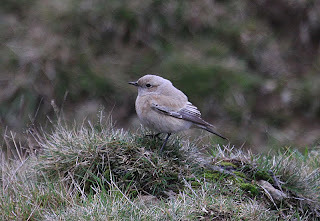 I travelled to Clee Hill near Ludlow in the depths of Shropshire with Steve Haynes to see a female Desert Wheatear. Steve was familiar with this probably underwatched area. It was certainly new to me though. The Wheatear had been in an area of derelict buildings just below the car park near the summit of the hill. The bird was in view as we parked up, appearing briefly on the top of a grassy bank before disappearing over the other side. There were also a good many familiar faces from the West Mids birding fraternity many with cameras. There was alot of movement as birders attempted to get better views which in turn made the bird mobile although thankfully it stayed in the same general area. Eventually the bird settled in a mossy hollow and gave everyone excellent views. 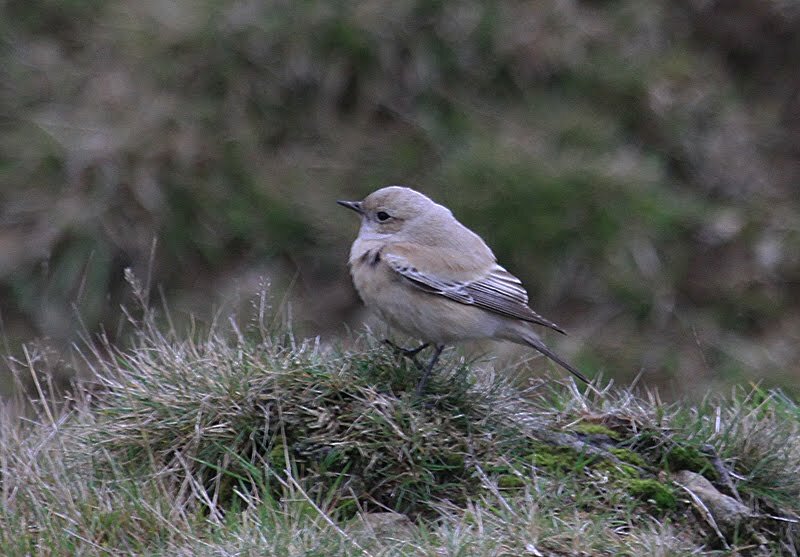 The bird found some relief from the strong westerly wind in the hollow while the birders made their own arrangements to avoid the cold blast on the more exposed slopes as the wind continued to strengthen. On the way back we checked out a site for Dipper but only managed a Kingfisher. Despite the heavy cloud cover the views across the miles of unspoilt countryside were outstanding. An area I would certainly like to visit again.